Poring grad school up and running, but that won’t stop our new scheme from happening! Here’s what we have for our update today! A harvester of souls and a fierce foe should you encounter him! Pure and frail, yet relentless and unstoppable should you summon her wrath. windia is truly the embodiment of the wind! Perhaps the scariest aspects about Serpens are his sharp teeth, his muscly build and his blinding speed…that’s a lot to fear! A talented mage with a lot to prove to himself! Not only are these hornets extremely agressive, their poison alone is worthy of respect! The materialization of nature itself! But that’s not all! Our pack this week also bundles in Dragonlord Demios! an animated sideview Dragon! Demios is an extremely smart dragon, but he is also extremely agressive! I would like to thank everyone who has shown any sort of support for the Librarium so far! Thank you guys once again! I wouldn’t never miss this every tuesday, in fact i was concern that you didn’t make any update the last week (then I just read twitter and all was clear xD), but anyway, this new RTP is awesome, I wasn’t sure if I want to use Animated enemies at least for now, but with this Dragon i’m sure that i have to use it, I LOVE IT ♥, even one of my friends that love Dragons when she looked the blue version of Demios she almost scream of excitement. Haha thanks for your continued support Nadren! I’m very happy to hear you and your friends liked it! Stay tuned for more! Thank you very much for your support! I strive to improve it with every release! Haha I do Elliot, Thank you very much it means a lot to hear all that! But don’t say that! Just gotta practice up a lot! Thanks for the heads up too, sometimes I forget stuff like that since there’s a lot going on around these parts! I actually run the animated battler poll through Patreon! You know, it’s interesting because the new scheme I’ve been considering for a while and which I unveiled today is similar to what you mentioned, check it out if you get the chance! It also is really nice to hear you like my style haha, I think maybe I can consider the tutorials or at least speed paints, I plan to start using my youtube channel more often from now on, particularly for quicker announcements, previews and perhaps, said speed paints/Tutorials! I usually keep all updates regarding to what is being worked on through Twitter and the patreon feed! And lol no way I’m gonna implement a character limit! How else would I get to read awesome posts like this! Thanks for the continued support! Though remember, starting febraury we switched to a bi-weekly format, meaning the next big update posting will happen on the 29th! Thanks for the continued support and stay tuned! Aha I think I’ll leave the art to you although knowing how to draw a slime is always helpful aha. When I saw the new system on the news first I thought he has even seen my plea for more animated battlers, great minds must think a like ;), and I also may have nearly broke my iPad smashing the new system button in the poll, which seems to be very popular, the only problem with bi weekly is its so far away haha, but I can’t wait sine their may be more and the art will be somehow better than it already is! Should I send you the animations through Twitter or leave my email here or drop it in a comment? Finally don’t tell handle this, but I may check out this channel more than his haha. One more thing. My person has a transformation, but the dragon is a bit too big. Could I resize it to 75%, or would that bypass your terms? I believe this is already doable through Yanfly’s sideview script with the scale option! The plugin was meant to be used on enemies, and even if it did work, if I put in the Actors tab, that would make his human form smaller. Sorry for not specifying Actor. The size is perfect, but could you do the blue color? Alright! Thanks so much! 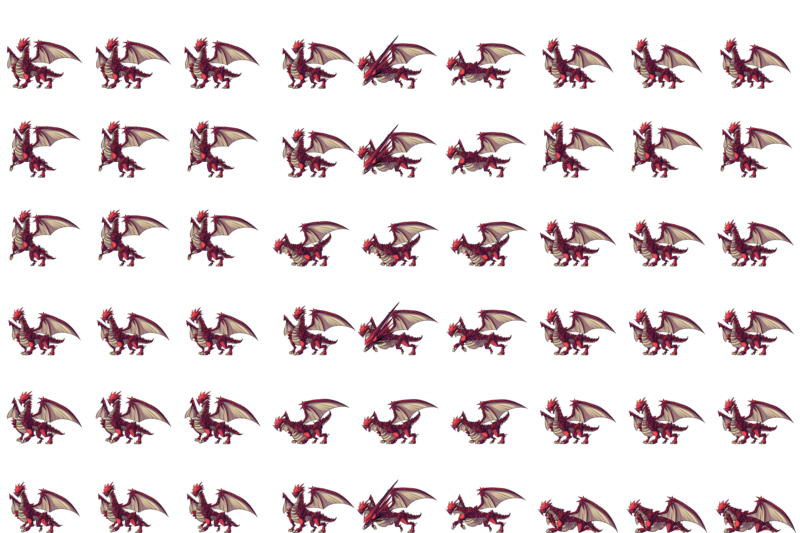 One last thing, I recolored the face sprite for the dragon, is that OK? So, do you mind if I use the blue dragon resized to 75% and the blue dragon face sprite?